How is Bible Translation Done? In the last post ("Why are Bible Translations Necessary?") I pointed out that translations of the Bible are necessary because it was originally written in Hebrew and Greek, and most of us can't read or understand those languages in our context today. So the Bible we read made its way from those languages to ours, and in this post I want to say a little about how that happens. In their book, How to Choose a Translation for All Its Worth, Gordon Fee and Mark Strauss say, "The ultimate concern of translation is to put a Hebrew or Greek sentence into meaningful English that is equivalent to its meaning in Hebrew or Greek" . But as soon as we start talking the language of "meaning," we are also talking the language of interpretation. Fee and Strauss don't shy away from that fact when they admit, "If the goal of translation is to reproduce the meaning of the text, then it follows that all translation involves interpretation" . This means that translators must be "at home" in two worlds: the ancient world and the modern one. They use all the tools at their disposal - archaeology, linguistics, history, theology, etc. - to carry the words, sentences, and phrases from one culture to another. Translation is never as simple as replacing each biblical word with an English word because there is seldom a one-to-one correspondence between the languages. And even if the languages did correspond more closely, translators still must account for semantic ranges (words have multiple meanings based on the context in which they are used), metaphors, and idioms. Fee and Strauss believe that "idioms represent some of the greatest challenges for a translator" . For example, if your group is getting supplies ready for a trip the next day, and a student asks you when the bus is going to leave, you might naturally reply, "We're hitting the road at the crack of dawn." How would that statement be translated literally? "We will punch the street when the sky breaks apart and the sun rises. A strictly literal translation gives the right words but misses the meaning. Or consider Matthew 1:18. Literally it says, as Fee and Strauss point out, "before her marriage to Joseph, Mary was discovered to be 'having in belly' (en gastri echousa)" . Again, a literal translation of the verse would make a mess of it. This is an idiom that meant Mary was pregnant, not that she needed to get on a diet. All Bible translations can be plotted on a spectrum between form and function. 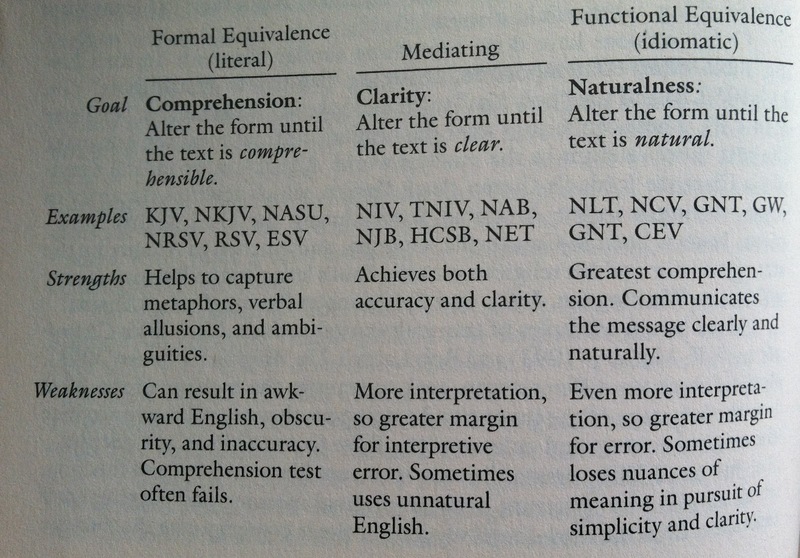 On one side, there are formal equivalence translations that are more literal, or word-for-word. They seek to produce an understandable English version while keeping the form of the original Hebrew or Greek. Many readers complain that these translations are choppy and don't read smoothly. On the other side, there are functional equivalence (also known as dynamic equivalence) translations that are looser in form because they try to contemporize the meaning of the original words in highly readable and stylized English sentences. Between those ends is a mediating position that tries to have the best of both worlds. "Translation is . . . always a two-step process: (1) Translators must first interpret the meaning of the text in its original context. Context here means not only the surrounding words and phrases, but also the genre (literary form) of the document, the life situation of the author and the original readers, and the assumptions that those authors and readers would have brought to the text. (2) Once the text is accurately understood, the translator must ask, How is the meaning best conveyed in the receptor language? What words, phrases, and idioms most accurately reproduce the author's message?" . 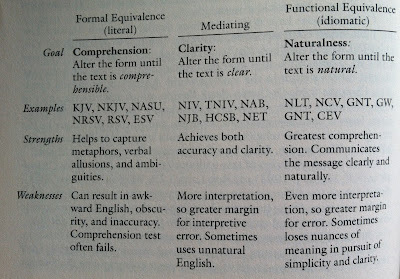 Gordon D. Fee and Mark L. Strauss, How to Choose a Translation for All Its Worth: A Guide to Understanding and Using Bible Versions (Grand Rapids, MI: Zondervan, 2007), 21. Why are Bible Translations Necessary?